, a gentleman eminent in the very different characters of dramatic poet and architect, was descended from a family originally of Ghent in Flanders. His grandfather, Giles Vanburg, being obliged to quit his native country on account of the persecution of the protestants by the duke of Alva, came to England, and settled as a merchant in London, in the parish of St. Stephen, Walbrooke, where he continued until his death in 1646. He left a son, Giles Vanbmgb, who settled in the city of Chester, and was, it is supposed, a sugar-baker, where he acquired an ample fortune. 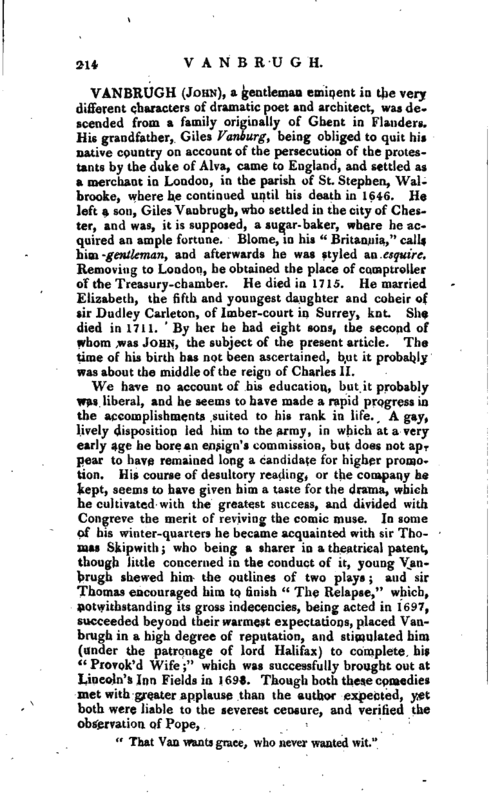 Blome, in his “Britannia,” calls him gentleman, and afterwards he was styled an esquire. Removing to London, he obtained the place of comptroller of the Treasury-chamber. He died in 1715. He married Elizabeth, the fifth and youngest daughter and coheir of sir Dudley Carleton, of Imber-court in Surrey, knt. She died in 1711. By her he had eight sons, the second of whom was John, the subject of the present article. The time of his birth has not been ascertained, b,ut it probably was about the middle of the reign of Charles II. < f That Van wants grace, who never wanted wit.“| In the same year, 1693, he brought out his comedy of” Æsop,“which was acted at Drury-Lane, and contains much general satire and useful morality, but was not very successful.” The False Friend,“his next comedy, came out in 1702. He had interest enough to raise a subscription of thirty persons of quality, at 100l. each, for building a stately theatre in the Hay-Market; on the first stone that was laid of this theatre were inscribed the words Little Whig, as a compliment to a celebrated beauty, lady Sunderland, second daughter of the duke of Marlborough, the tast and pride of that party. The house being finished in 1706, it was put by Mr. Betterton and his associates under the management of sir John Vanbrugh and Mr. Congreve, in hopes of retrieving their desperate fortunes; but their expectations were too sanguine. 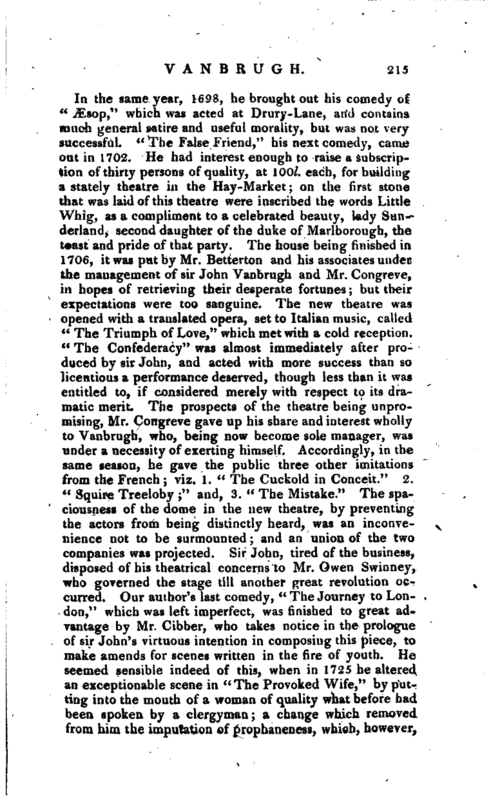 The new theatre was opened with a translated opera, set to Italian music, called” The Triumph of Love,“which met with a cold reception.” The Confederacy“was almost immediately after produced by sir John, and acted with more success than so licentious a performance deserved, though less than it was entitled to, if considered merely with respect to its dramatic merit. The prospects of the theatre being unpromising, Mr. Congreve gave up his share and interest wholly to Vanbrugh,” who, being now become sole manager, was under a necessity of exerting himself. Accordingly, in the same season, he gave the public three other imitations from the French; viz. 1. “The Cuckold in Conceit.” 2. “Squire Treeloby;” and, 3. “The Mistake.” The spaciousness of the dome in the new theatre, by preventing the actors from being distinctly heard, was an inconvenience not to be surmounted; and an union of the two companies was projected. Sir John, tired of the business, disposed of his theatrical concerns to Mr. Owen Swinney, who governed the stage till another great revolution occurred. Our author’s last comedy, “The Journey to London,” which was left imperfect, was finished to great advantage by Mr. Cibber, who takes notice in the prologue of sir John’s virtuous intention in composing this piece, to make amends for scenes written in the fire of youth. He seemed sensible indeed of this, when in 1725 he altered an exceptionable scene in “The Provoked Wife,” by putting into the mouth of a woman of quality what before had been spoken by a clergyman; a change which removed from him the imputation of prophaneness, which, however, | as well as the most gross licentiousness, still adheres to his other plays, and gave Collier an irresistible advantage over him in the memorable controversy respecting the stage. 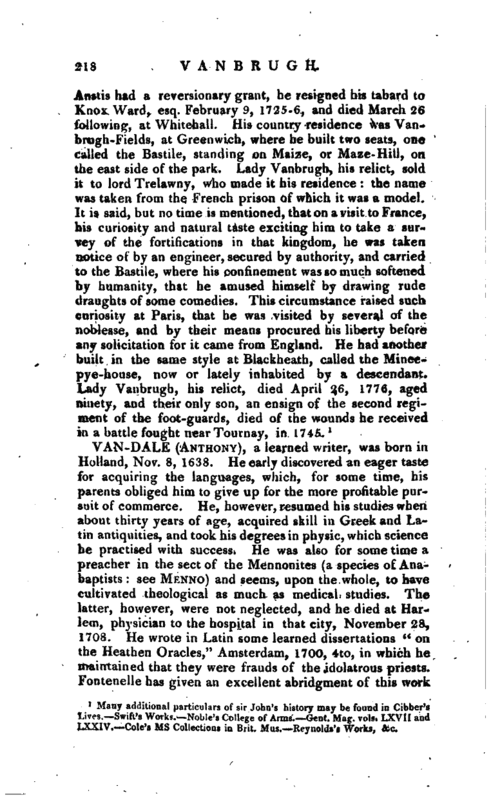 our imagination, with which the artist is more concerned than will; absolute truth.“”To speak of Vanbrugh,“adds sir Joshua,” in the language of 'a painter, he had originality of invention; he understood light and shadow, and had great skill in composition. To support his principal object, he produced his second and third groupes or masses. He perfectly understood in his art, what is the most difficult in ours, the conduct of the back-ground, by which the design and invention are set off to the greatest advantage. What the back-ground is in painting, in architecture is the real ground on which the building is erected; and no architect took greater care that his work should not appear crude and hard, that is, that it did not abruptly start out of the ground without expectation or preparation. 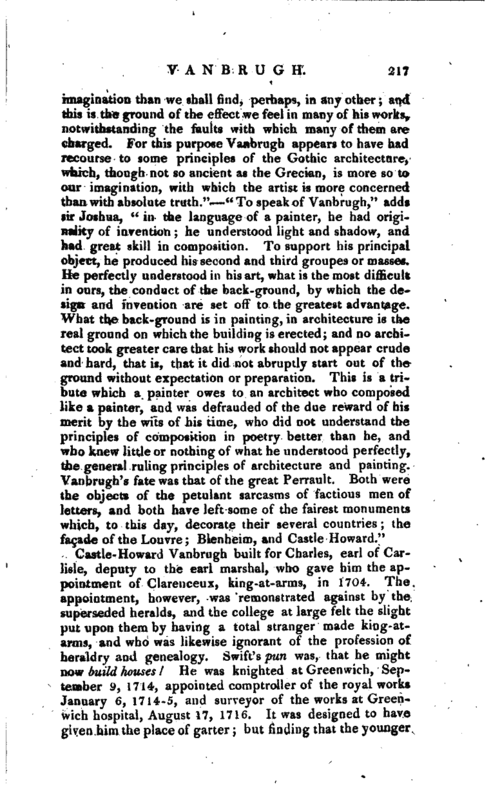 This is a tribute which a painter owes to an architect who composed like a painter, and was defrauded of the due reward of his merit by the wits of his time, who did not understand the principles of composition in poetry better than he, and who knew little or nothing of what he understood perfectly, the general ruling principles of architecture and painting. Vanbrugh’s fate was that of the great Perrault. Both were the objects of the petulant sarcasms of factious men of letters, and both have left some of the fairest monuments which, to this day, decorate their several countries; the fagade of the Louvre; Blenheim, and Castle Howard." 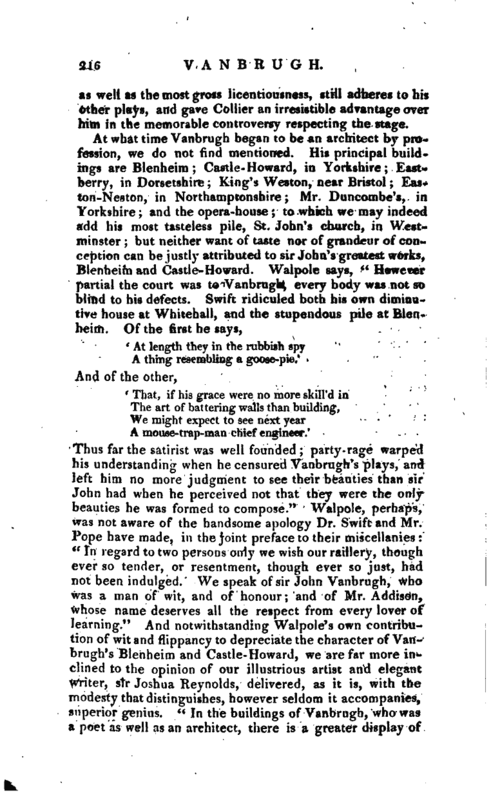 Many additional particulars of sir John’s history may be found in Gibber’s Lives. Swift’s Works. Noble’s College of Arms. —Gent. Mag. vols. LXVII and LXXIV. Cole’s ms Collections in But. Mus. Reynolds’s Works, &c.